On September 21, 2013, the Day of the Nativity of our Most Holy Virgin Mary, Metropolitan Hilarion of Volokolamsk, head of the Moscow Patriarchate’s department for external church relations, celebrated the Divine Liturgy at the Church of the Nativity of Our Lady-at-Staroye-Simonovo. Among numerous worshippers were staff members of the Moscow Patriarchate Publishers and editorial boards of Moscow Patriarchate’s periodicals. Greeting His Eminence Hilarion after the service, Archpriest Oleg Vorobyev, dean of the Danilov District, praised God “for giving us to celebrate this great feast on the patronal day of our old church, the memorial to the Kulikovo Battle heroes”. He also thanked His Holiness Patriarch Kirill for having sent precisely Metropolitan Hilarion to celebrate “in this 500 years-old church which was always loved by both the Russian people and the power that be – grand princes, tsars, emperors, as the burial place of the hero monks Peresvet and Oslyaba of the Battle of Kulikovo Field”. He also spoke about the glorious history of the church before the 1917 Revolution and its miserable lot during the Soviet times. In 1989, it became one of the first churches to be reopened after the long godless time, he said. 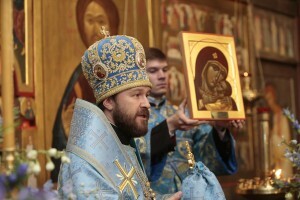 Addressing the congregation, Metropolitan Hilarion spoke about the Feast of the Most Holy Mother of God as “the day when we feel her special closeness to us because She is our Heavenly Patroness Who intercedes for us, protects us against every evil and Who has repeatedly averted dangers from our beloved Motherland”. “In this church”, he said, “the relics of two monks, two heroes of our Motherland, Alexander Peresvet and Andrey Oslyabya, are kept… We know that at hard times when the life of our Motherland was at stake, the Most Holy Mother of God inspired our warriors to perform feats. We know that in these critical moments the Lord gave our Motherland the people who did not spare their life for the sake of their land. Such were Peresvet and Oslyabya, who, with the blessing of St. Sergius of Radonezh, went out, still clad in their monastic robes, to fight with the enemy and gave their lives for the people, the Motherland and the faith… Enemies repeatedly attacked out land. Sometimes they managed to enslave our Motherland or some of her parts for a while. But sooner or later the people would rise and drive away the invaders from their land. And to this day our land stands safe and sound despite all the calamities and historical twists and turns she had to go through”. In a special address to the present staff of the Moscow Patriarchate Publishers and church periodicals, Metropolitan Hilarion called them to remember about their responsibility for the words and the message of books and magazines published by the Church. Metropolitan Hilarion also blessed the memorial plaque commemorating the visit made by Emperor Nicholas II to the church in 1900. The plaque has been restored by the Moscow branch of the Imperial Orthodox Palestinian Society on the occasion of the 400th anniversary of the Romanov Dynasty.